There have been some amazing sales happening online lately that I couldn't help but take advantage of. Since my closet right now is stocked full of heavy winter sweaters I've been trying to pick up pieces that I can transition easily into Spring when the weather is warm. While shopping it's important to keep in mind where you'll wear these items to. I try to buy pieces that I can wear on weekends as well as to the office. It's always important to get the most for your money. Love it all! That bag was an excellent pick-up, and adoring that long necklace. Really, so tempted! 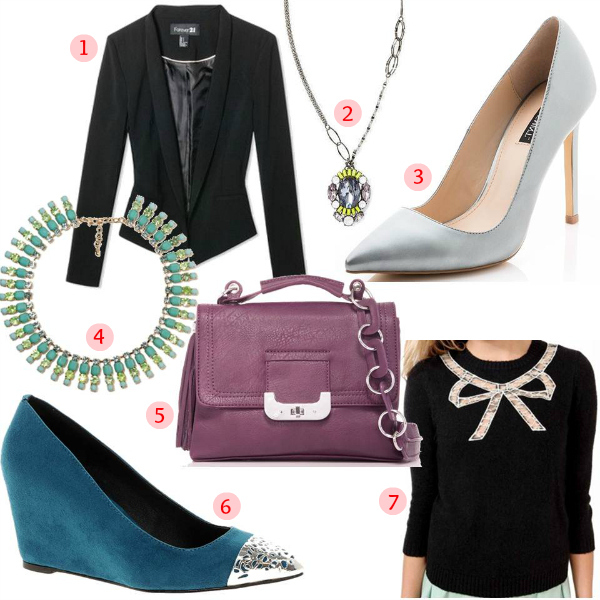 I love the Number 3 shoes and that gorgeous necklace. Great picks. I just found your blog through Bloglovin and I'm so glad I did. I'm following you now. You have really good fashion sense. Great buys! I love both of those necklaces! I'm loving #5 & 7!! Girl, you have such good tate! Can't wait to see how you wear these pieces! wow girl I am so jealous! I love those heels from shoemint, and on sale too? !